Automotive Electronics Control Unit (ECU) Market size is set to exceed USD 95 billion by 2024; according to a new research report by Global Market Insights, Inc. The global shipment is expected to grow at a CAGR of approximately 6% from 2018 - 2024. Increasing installation of the advanced features and ADAS in autonomous and luxury vehicles is driving the automotive electronics control unit market growth. Luxury vehicles deploy a large number of ECUs and offer advanced driving assistance benefits and 360º radar sensing. Developments observed in the design and manufacturing of electric vehicles (EVs) and hybrid electric vehicles (HEVs) are the key trends that will positively impact the market growth. A major transition observed in the ECU implementation in these vehicles includes control unit degradation that deactivates the unnecessary elements and eliminates optional GPS signals and offers low current consumption, improved safety, and electric function management. 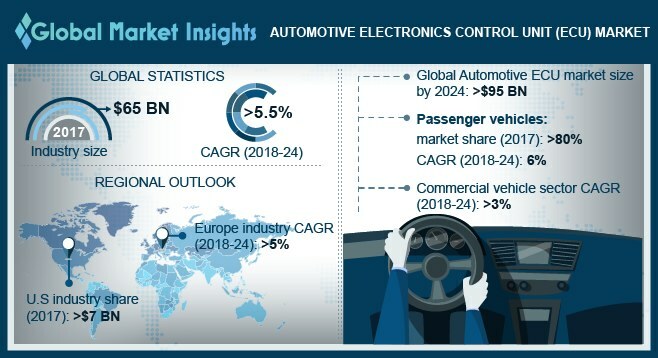 The rise in automobile production across the globe to cater to the increasing population requirement is further creating several opportunities for the automotive electronics control unit (ECU) market growth. The global automobile manufacturing market identifies smart connectivity and greener production initiatives, leading to an increased consumption of control units. Additionally, several favorable government reforms to control the road traffic and ensure driver safety drive the production of modern vehicles. Passenger vehicles are expected to grow at around 6% CAGR in the automotive ECU market. These vehicles include luxury cars that deploy the highest number of ECUs owing to their requirements for enhanced performance. Modern passenger cars deploy several automated features such as airbag security and energy-efficient engines. ECUs in the utility and commercial vehicles provide several IoT-based functions, controlling and managing the overall engine capacity functions. Additionally, in commercial vehicles, the components offer efficient cabin test and control functions for door modules that require the complex handling and control, further driving the automotive electronics control unit market demand. High consumption of the commercial vehicles across the globe due to increased industrial production capacity and government infrastructure development initiatives is driving the market growth. Battery Electric Vehicles (BEVs) automotive electronics control unit market accounted for over 30% share in terms of unit shipment in 2017 and is expected to grow due to the high demand for energy efficient vehicles across various regions. Several countries are focusing on improving their carbon emission rates and are developing various initiatives & programs to promote the adoption of these solutions. Major automobile manufacturing players are supporting the government initiatives to reduce the pollution rate and contribute to the sustainable goals achievement. The Europe automotive electronics control unit (ECU) market is expected to grow at a CAGR of over 5% from 2018 to 2024. The growth can be credited to the presence of large number of prominent automobile manufacturers in Germany, France, and Italy. In addition, the increasing government legislation and supportive policies are further expected to propel the automotive ECU market share. Key companies providing enhanced solutions in the automotive electronics control unit market comprise Bosch Group, Hitachi Automotive Systems, Hyundai MOBIS, Delphi Technologies, Lear Corporation, Johnson Control, Continental AG, Mitsubishi Electric Corporation, Altera Corporation, and Magneti Marelli. Prominent players are focusing on the development of technically-advanced products to gain a competitive advantage. An emerging trend is the development of semi-autonomous and self-driving cars exhibiting the latest connectivity technologies. Furthermore, several companies in the U.S. and China started autonomous vehicle testing in compliance with the regional regulations.